What an amazing time for space exploration. 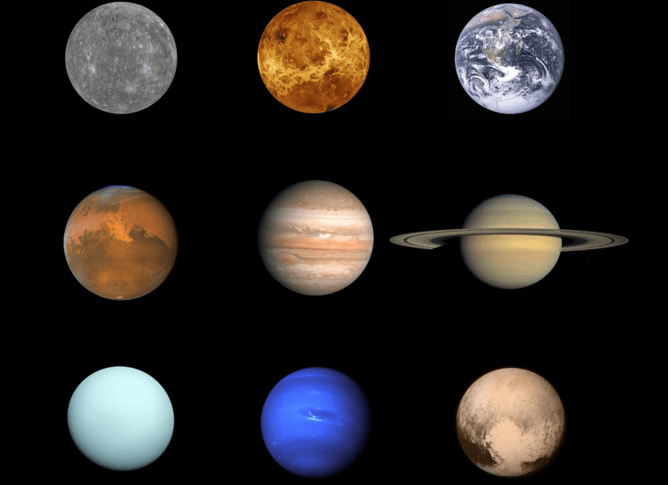 The picture of the solar system from my childhood is now complete, as seen in this great family portrait produced by Ben Gross, a research fellow at the Chemical Heritage Foundation, and distributed via twitter. I love this image because it shows each world in close-up, using some of the latest pictures from space exploration. As we celebrate seeing Pluto for the first time, it’s remarkable to think that this completes a 50 year task. But science never stays still. When New Horizons left Earth in January 2006, Pluto was a planet. Later that year an important reassessment was made of the Solar System and Pluto became the first of the dwarf planets. The Planetary Society’s Senior Editor, Emily Lakdawalla, has teamed together the ‘Not-Planets’. 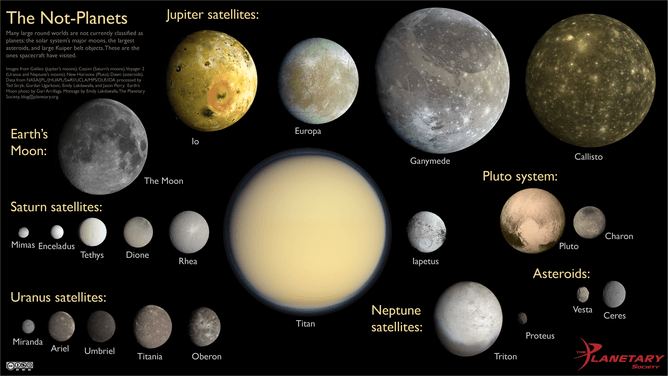 These are the close-up views, shown to scale, that have been captured of the largest moons, asteroids and dwarf planets. Montage by Emily Lakdawalla. The Moon: Gari Arrillaga. Other data: NASA/JPL/JHUAPL/SwRI/UCLA/MPS/IDA. Processing by Ted Stryk, Gordan Ugarkovic, Emily Lakdawalla, and Jason Perry. It clearly shows that there are many diverse and interesting worlds to explore beyond the eight planets of our solar system. New Horizons is the first spacecraft to start exploring the Kuiper Belt, an icy realm of objects orbiting 5 billion kilometres or more beyond the sun. It’s the chance to observe a dwarf planet, something distinct from the terrestrial planets and the gas giants. It was in 1992 that astronomers discovered Pluto was not alone. The first Kuiper Belt Object, designated 1992 QB1, is a 100-kilometre sized object that orbits well beyond Pluto. Now more than 1,000 objects have been detected in this realm, and the belt likely contains many more. Most are small compared to Pluto, but there are some stand-outs such as Quaoar, and the dwarf planets Eris, Makemake and Haumea. The suspense of the mission has certainly been high. To maximise the amount of data that New Horizons could collect, the spacecraft did not communicate with Earth for the duration of the flyby. As described by Mission Operations Manager Alice Bowman, it was the moment when you let your child free. The team had prepared New Horizons, told it what work needed to be done and in that radio silence they had to trust that all would go to plan. Just before 11am today (AEST), New Horizons checked in – showing it to be the perfect child to the relief of its many anxious “parents”. It was only a brief phone home, but in that short time the scientists confirmed that all telemetry was spot-on, the spacecraft followed the path that had been set for it and there were no error messages recorded on any of the systems. No data was transferred in that brief connection, but it was established that the main computer system, which records all the data collected by the spacecraft, showed the expected number of segments had been used. In other words, data had been collected. We will soon see Pluto and Charon in even higher resolution. Their geology will be mapped, the surface compositions and temperatures will be measured, atmospheres will be probed and new discoveries will be made. It’s also been wonderful to see the public become so enthralled with the latest image from Pluto. Humans are incredibly good at spotting patterns and it seems that Pluto wears his heart on his sleeve for us. I’m also equally intrigued to discover that the smooth part of Pluto’s heart is made of carbon monoxide ice. This was already known from ground-based observations, except never before seen in such detail. It’s reassuring to have a good match between the old and new data. But look again … is it a heart or something entirely different stealing the show? Tanya Hill is Honorary Fellow of the University of Melbourne and Senior Curator (Astronomy) at Museum Victoria.